My first close encounter with collage art was somewhat incendiary. I was rooming in a house with students and other vagabonds. Someone had done a collage across a wall behind a cooking range. It was one made mostly of hundreds of magazine clippings. In time, since it had no seal on it, the ends of many of the clippings had dried and curled out from the wall. Along came a cook who used a tattered old dish cloth as a heat glove when he was removing a pan from the stove. At any rate, the rag caught fire and without being aware of that fact, he swung it around to hang it on a nail on the wall amid the collage. In a few moments the entire wall of clippings was on fire. Fortunately a blanket was at hand and we managed to snuff out the blaze. It is said that the art of collage began with painter Max Ernst. Ernst created two or three surrealistic novels in that genre. My own favorite collage artist is Wilfried (Podreich) Satty, a German immigrant who settled in San Francisco. He became well known in the psychedelic era. 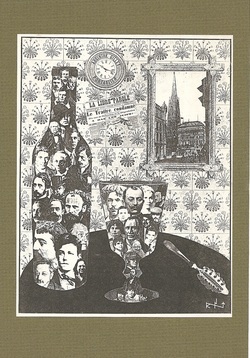 Satty had done collage illustrations for books such as a collection of Edgar Poe’s stories, Ludlow’s Hashish Eater, Dracula, his own Visions of Frisco and others. He worked mostly with overhead cameras modifying and building his collage material into art. He also did a spate of music posters of the era. Jim Herder is a contemporary disciple of Satty. I have not worked in collage to any extent, myself. I have probably done less than a dozen works. All but one were either discarded or gifted to someone. I only have one remaining which is concerned with the liquor absinthe. It appeared with an article I wrote on the subject in SECONDS Magazine. I have some tentative plans for illustrating a few books with the technique in the future. Tantamount to collage, one must have good illustration sources and know how to construct images from them which will be imaginative, eye-catching and provocative. It is an art form at the behest of almost anyone with paper, glue, scissors and a stack of old magazines or book illustrations.